After four rounds of Top 36 semifinals, the judges have selected this season's Top 12 - with 13 contestants. Click on a performer's photo below to see full videos of all of their performances season-long and many of their interviews. Videos come from our favorite American Idol blog - be sure to check it out: mjsbigblog. On May 5, most of the American Idol videos were removed from the Internet. We will try to find replacement sources as soon as possible. 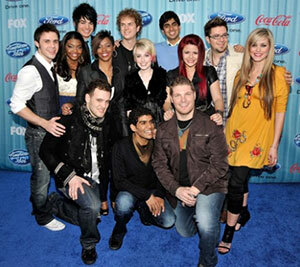 Congratulations to Kris Allen for winning American Idol 2009 - and to all of the finalists. We wish you all the best!